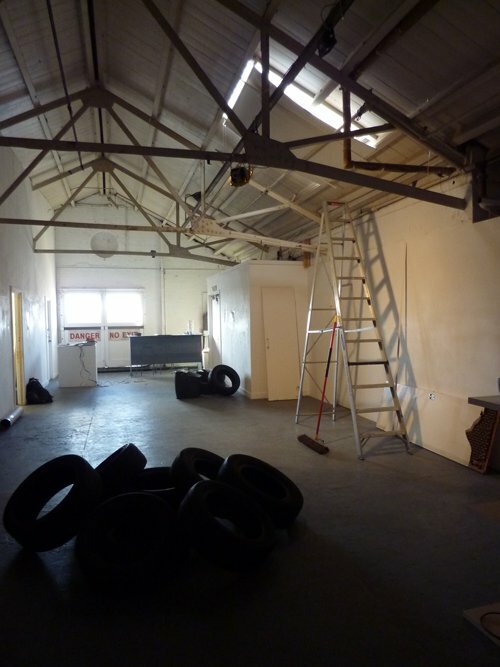 Summit Gallery is a new artist-led gallery and project space overlooking the Olympic Park in Hackney Wick. We talk to Director Natalie Sanders and the project's first artist-in-residence Riccardo Iacono. Iacono is interested in sensations of vertigo, in the perspectival shifts of the bird’s eye view, and in digital manipulations of the everyday. Colour photographs tacked precariously to the gallery walls show traffic cones or upturned rubbish crates distorted by fluid, digital brushstrokes. 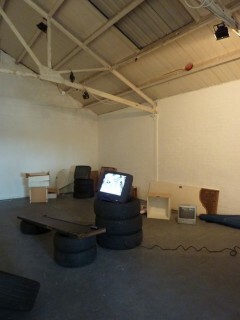 TV monitors, balanced on piles of discarded tyres, play dizzying video clips that track the sweeping gestures of the artist throwing objects – garden peas, wet cloths – in various public and private spaces. Iacono’s improvisational, process-led work fits well with Summit’s ethos – to support experimentation, research and collaboration, and to offer artists opportunities to exhibit works that might be difficult to show elsewhere. Summit takes up the baton from previous Mother Studios project Elevator Gallery, which ran from 2007-2012 and supported transgressive and experimental practice. It preserves Elevator’s open submission policy, but this time with a team of invited selectors, rather than gallery staff, choosing the programme. Summit received over 200 submissions from their first call out – an indication, perhaps, not only of the number of artists in need of exhibition space, but also of how appealing Summit’s carte blanche approach is. Against the backdrop of the edgy and ever-transitory Hackney Wick, Sanders’ calm demeanour and steadfast commitment is encouraging. The past few years has been a time of particular upheaval for the area’s artist community and several projects – including Wallis Gallery, The Residence and Decima – have had to move on. Tag search artist-led for fast access to essays, profiles and resources.